CANADA-For a unique and truly unforgettable golfing experience, a golf rail vacation package combining golf at a variety of stunningly scenic golf courses and a two-day rail tour through the incredible Canadian Rockies can’t be beat. The Canadian Rockies have long been recognized as one of the true natural wonders of the world. For over one hundred years, tourists have come to the Canadian Rockies to marvel at the incredible scenery and luxuriate in the peace and quiet of one of the most beautiful and unspoilt wilderness areas on Earth. The towering snow-capped mountains, cobalt blue skies, sparkling-clear glacier-fed rivers and hushed, green forests are the reality of the Canadian Rockies. Even better, the Canadian Rockies also feature some of the most challenging and enjoyable golf courses in the world. Imagine playing on a classic championship golf course near the attractive resort towns of Jasper or Banff, designed by Canada’s master golf course architect, Stanley Thompson. Take in the Kananaskis Country Golf Courses, Mt. Kidd and Mt. Lorette designed by Robert Trent Jones, Sr. And the most recent additions to golf in the Canadian Rockies, SilverTip Golf Resort a Les Furber design and the Gary Browning creation at the Stewart Creek Golf & Country Club. Each classic course is an intriguing blend of beautiful landscapes and challenging terrain. Then, with our exclusive golf rail vacation package, after enjoying luxurious accommodation, fine dining and unique shopping opportunities, boarding the Rocky Mountaineer Railtour for the ultimate train travel experience. 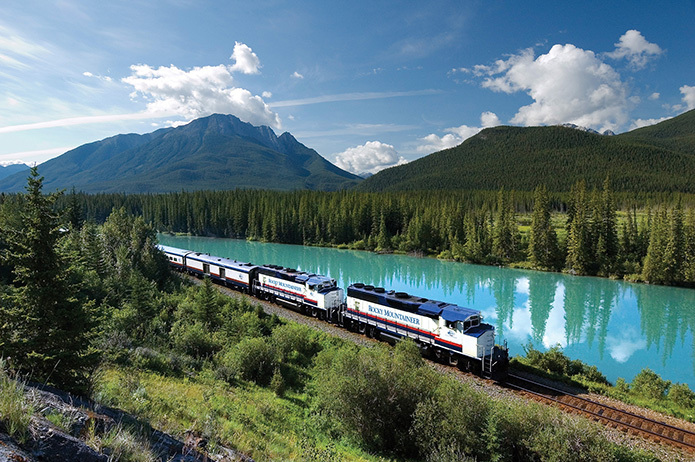 The Rocky Mountaineer is a unique two-day journey through some of the world’s most spectacular scenery. Every guest is assured of the best of Canadian hospitality and service as the luxurious train weaves it’s way along historic rail routes. The landscape and history is brought to life by knowledgeable onboard commentary- and by the glimpses of bears, moose and eagles. Disembarking on the west coast, the traveler is greeted by the cosmopolitan attractions of Vancouver and the 2010 Olympic village of Whistler, British Columbia. Whistler, long famous as one of the very best ski resorts in North America, is quickly becoming popular as a destination golf resort as well. World-class accommodations, excellent restaurants and beautiful mountain scenery are complemented by several fine golf courses. Designs by Jack Nicklaus (Nicklaus North Golf Course), Robert Trent Jones Jr. (Chateau Whistler Golf Club), Arnold Palmer (Whistler Golf Club), and Robert Cupp (Big Sky Golf & Country Club), each course has its own special character and challenges. Again, as in the Canadian Rockies, the scenery, fresh air and general laid-back friendliness are provided free of charge! For all your Canadian Rockies travel needs, be sure to visit VancouverCanada.com and BCCanada.com, and get a free copy of the helpful guides and BC maps provided by the official tourism authorities of Vancouver and British Columbia. If you want to expand your Canadian Rockies vacation, BanffTravel.com and JasperVacations.com offer great information and planning advice to make the most out of your time in the Rocky Mountains.